There seems to be no end to the diversity of colors, shapes, and sizes exhibited by Nepenthes and their pitchers. 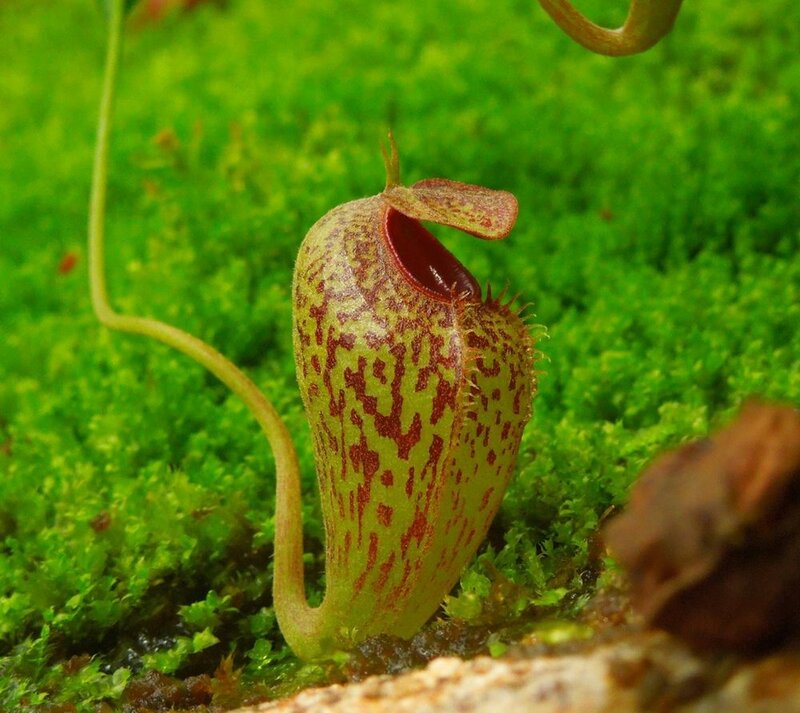 These wonderful carnivorous plants grow these pitchers as a means of supplementing their nutritional needs as the habitats in which Nepenthes are found are lacking in vital nutrients like nitrogen. There are as many variations on the pitcher theme as there are Nepenthes but all function as traps in one form or another. How they trap insects is another topic entirely and some species have evolved incredible means of making sure prey does not escape. Some of my favorites belong to those species that employ sticky mucilage. Arguably one of the most iconic of this type is Nepenthes inermis. This species is endemic to a small region of Sumatra and, to date, has only been found growing on a handful of mountain peaks in the western part of the country. The specific epithet ‘inermis’ is Latin for ‘unarmed’ as was given in reference to the bizarre upper pitchers of this plant. They look more like toilet bowls than anything carnivorous and indeed, they lack many of the features characteristic of other Nepenthes pitchers such as a peristome and a slippery, waxy coating on the inside of the pitcher walls. These may seem like minor details but consider the role these features play in other Nepenthes. A peristome is essentially a brightly colored, slippery lip that lines the outer rim of the pitcher mouth. Not only does this serve in attracting insect prey, it also aids in their capture. As mentioned, the peristome can be extremely slippery (especially when wet) so that any insect stumbling around on the rim is much more likely to fall in. Once inside, a waxy coating on the inside of some pitchers aids in keeping insects down. They simply cannot get purchase on the waxy walls and therefore cannot climb back out. So, for N. inermis to lack both features is a bit strange. Another interesting feature of N. inermis pitchers is the highly reduced pitcher lid. It hasn’t disappeared completely but compared with other Nepenthes, this pitcher lid barely registers as one. For most Nepenthes, pitcher lids serve multiple functions. For starters, they keep the rain out. Nepenthes are msot at home in humid, tropical climates where rain is a daily force to be reckoned with. For many Nepenthes, rain not only dilutes the valuable digestive soup brewing within each pitcher, it can also cause them to overflow and dump their nutritious contents. Pitcher lids can also help in attracting prey. Like the peristome, they are often brightly colored but many also secrete nectar, which insects find irresistible. Lured in by the promise of food, some insects inevitably fall down into the pitcher below. Looking into the pitcher of Nepenthes inermis. Considering the importance of such structures, it becomes a little bit confusing why some Nepenthes have evolved away from this anatomy. The question then remains, why would a species like N. inermis no longer produce pitchers with these features? Amazingly, the answer actually lies within the pitcher fluid itself. Tip over the upper pitchers of N. inermis and you will soon discover that they are filled with an extremely viscous mucilage. It is so viscous that some have reported that when the pitchers are held upside down, the mucilage within can form an unbroken stream of considerable length. Its the viscosity of this fluid that is the real reason that N. inermis is able to capture prey so easily. Insects lured to the traps can catch a drink of the nectar on the tiny lid. In doing so, some inevitably fall down into the pitcher itself. The upper pitcher of the closely related Nepenthes dubia. Instead of slippery walls or downward pointing hairs keeping the insects in, the viscous pitcher fluid quickly engulfs the struggling prey. Some have even suggested that the nectar secreted by the tiny lid has narcotic effects on visiting insects, however, I have not seen any data demonstrating this. Once caught in the fluid, insects easily slide their way down into the depths of the pitcher where they can be digested. This is probably why the pitchers are shaped like tiny toilet bowls; their shape allows for a large sticky surface area for insects to get stuck while prey that has already been captured is funneled down to where digestion and absorption takes place. In a way, these types of pitchers behave surprisngly similar to the sticky traps utilized by other carnivorous plants like sundews (Drosera spp.). The viscous fluid also comes in handy during the frequent rains that blanket these mountains. As mentioned above, rain would quickly dilute most pitcher fluids but not when the pitcher fluid itself is more dense. Water sits on top of the viscous mucilage and when the pitchers become too heavy, they tip over. The water readily pours out but little if any of the pitcher fluid is lost in the process. It seems that species like N. inermis no longer fight the elements but rather have adapted to meet them head on. As such, they no longer have a need for a large pitcher lid. Nepenthes jamban takes the toilet bowl shape to the extreme. Nepenthes inermis is not alone in having evolved pitchers like this. Viscous pitcher mucilage is a trait shared by its closest relatives - N. dubia, N. flava, N. jacquelineae, N. jamban, N. talangensis, and N. tenuis, as well as even more distantly related species such as N. rafflesiana. Because prey capture is so important for the fitness of individuals, it is no wonder that so many different forms have evolved within this genus. In fact, many experts believe that variations in the way in which prey is captured and utilized is one of the main reasons why Nepenthes have undergone such a dramatic adaptive radiation. Sadly, the uniqueness in form and function of these pitchers has landed many of these species on the endangered species list. As if habitat destruction wasn’t already pushing some to the brink, species like N. inermis are being poached at alarmingly unsustainable rates. Due to their limited distributions, most populations simply cannot recover from even moderate levels of harvesting. The silver lining in all of this is that many Nepenthes are extremely easy to grow and propagate provided their basic needs are met. As more and more folks enter into the carnivorous plant hobby, hopefully more and more people will be sharing seeds, cuttings, and tissue cultured materials. In doing so, we can hopefully reduce some of the pressures placed on wild populations. Most pitcher plants in the genus Nepenthes seem pretty adept at catching prey. These plants specialize in nutrient-poor soils and their carnivorous habit evolved as a means of supplementing their nutritional needs. Despite the highly evolved nature of their pitfall traps (which are actually modified leaves), Nepenthes aren’t perfect killing machines. In fact, some get a helping hand from seemingly unlikely partners. Spend enough time reading about Nepenthes in the wild and you will see countless mentions of arthropods hanging around their pitchers. Some of these inevitably become prey, however, there are others that appear to be taking advantage of the plant. Nepenthes don’t passively trap arthropods. Instead, they lure them in with bright colors and the promise of tasty treats like nectar. This is not lost on predators like spiders, who are frequent denizens of pitcher mouths. Most notable to Nepenthes specialists are some of the crab spiders that frequently haunt Nepenthes traps. These wonderful arachnids sit at the mouth of the pitcher and ambush any insects that try to pay it a visit. Often times both predator and prey fall down into the pitcher, however, thanks to a strand of silk, the spiders easily climb back out with their meal. This may seem like bad news for the pitcher, however, recent research based out of the National University of Singapore has shown that this relationship is not entirely one sided. By studying the interactions between spiders and pitcher plants both in the lab and in the field, ecologists discovered that at least one species of pitcher plant (Nepenthes gracilis) appears to benefit greatly from the presence of crab spiders. The key to understanding this relationship lies in the types of prey N. gracilis is able to capture when crab spiders are and are not present. Not only did the presence of a resident crab spider increase the amount of prey in each Nepenthes pitcher, it also changed the types of insects that were being captured. Crab spiders are ambush predators that frequently attack prey much larger than themselves. It may seem as if this is a form of food robbery on the part of the crab spider but the spiders can’t eat everything. When they have eaten their fill, the spiders discard the carcass into the pitcher where the plant can make quick work digesting it for its own benefit. Over time, simply having a spider hunting on the trap led to a marked increase in the number of insects in each pitcher compared to those without a spider. Even if these meals are already half eaten, the plant still gains nutrients. Additionally, the types of prey captured by pitchers with and without crab spiders changed. The spiders were able to capture and subdue insects like flesh flies, which normally aren’t captured by Nepenthes pitchers. As such, the resident crab spiders make available a larger suite of potential prey than would be available if they weren’t using the pitchers as hunting grounds. The crab spiders may benefit the pitcher plant in other ways as well. Research on crab spiders has shown that their bodies are covered in pigments that register high in the UV spectrum. Insects can see UV light and often use it as a means of finding flowers as plants often produce UV-specific pigments in their floral tissues. The wide array of UV patterns on flowers are there to guide their pollinators into position. Researchers have documented that insects are actually more likely to visit flowers with crab spiders than those without, which has led to the idea that UV pigments in crab spiders actually act as insect attractants. Visiting insects simply cannot resist the UV stimulus and quickly fall victim to the resident crab spider. Could it be that by taking up residence on a Nepenthes pitcher, the crab spiders are increasing the likelihood of insects visiting the traps? This remains to be seen as such questions did not fall under the scope of this investigation. That being said, it certainly offers tantalizing evidence that there is more to the Nepenthes-crab spider relationship. More work is needed to say for sure but the closer we look at such interactions, the more spectacular they become! Southeastern North America is the true home of the carnivorous plants belonging to the genus Sarracenia. Seven of the approximately eight species in this genus reside in North America's coastal plain forests and nowhere else. These evolutionary marvels are famous the world over for their carnivorous pitfall traps but not all members conform to this style of prey capture. The most aberrant of these carnivores is the so-called parrot pitcher plant (Sarracenia psittacina). The parrot pitcher plant would be easy to pick out of a lineup, even with an untrained eye. Instead of tall, lanky, upright pitchers, it produces a rosette of smaller, entirely prostrate pitchers. Additionally, the leaf-like hood that covers the pitchers of its relatives appears to have grown into a dome-like structure speckled with translucent patches. Finally, the belly of each pitcher sports a leafy fin called an "ala" that runs the whole length of the tube. Indeed, with the exception of perhaps the purple pitcher plant (S. purpurea), the parrot is truly an oddball. Its unique appearance is likely an adaptation to seasonal flooding and has changed the way in which this particular species captures prey. The pitchers of the parrot pitcher plant do not function as pitfall traps like those of its relatives. Instead, this species utilizes the "lobster trap" method of prey capture. Lured to its pitchers by their bright colors, insects gradually explore the traps. The fin-like ala directs these unsuspecting victims to the mouth of the pitcher. The translucent patches on the domed hood lure the insect into a false sense of security. Once inside, the insects become disoriented and cannot easily find the proper escape rout. As they crawl farther into the pitcher, backward pointing hairs ensure that escape is impossible. Death is followed by digestion as the pitcher obtains yet another nutrient-rich meal. However, insects aren't the only game in town for the parrot pitcher plant. Because of its prostrate habit, the parrot pitcher plant regularly finds itself underwater whenever its already wet habitat floods. This would be bad news for most other pitchers as their upright position would allow whatever was inside to float out and away. Such is not the case for the parrot pitcher. Underwater, the pitchers become even more like a lobster trap. Everything from aquatic insects to tadpoles and fish can and do fall victim to this plant. As such, not even seasonal flooding can put a damper on this unique pitcher plants meal ticket. It is a wonderful example species adaptation. Like all members of the southeastern coastal plain community, the parrot pitcher plant is losing its habitat at an alarming rate. Habitat loss is an ever present threat, both in the form of outright destruction from logging and development as well as from sequestration of fire. Coastal plain communities are fire-adapted ecosystems and without it, the myriad species that call this region home are overgrown and choked out. Research has shown that the parrot pitcher plant, as well as other pitcher plants, greatly benefit from regular fires. Fire clears away competing vegetation and the plants respond with vigor. Luckily, parrot pitcher plant numbers are stable at this point in time. Its low growth habit saves it from threats like mowing, which means that it can do well in places like roadside ditches that are less favorable for its taller relatives. I have said it before and I will say it again, if you value species like the parrot pitcher plant, please do everything you can to support land conservation efforts. Please check out what organizations such as The Longleaf Alliance, Partnership For Southern Forestland Conservation, The Nature Conservancy, and The National Wildlife Federation are doing to protect this amazing region. Simply click the name of the organization to find out more. Species of the genus Nepenthes are as bizarre as they are beautiful. Known the world around for their carnivorous lifestyle, these plants looks like something out of a macabre art exhibit. It is easy to get caught up in this beauty. I often find myself lost in thought while staring at full grown specimen. How did this genus come to be? Why are they so diverse? What is going on with the morphology of these plants? Nepenthes hail from nutrient poor habitats, which has driven them to supplement their growth with nutrients gained via the breakdown of a variety of organisms. The business ends of a Nepenthes are their pitchers. We get so caught up in the bewildering diversity of shapes, colors, and sizes that we often overlook them as the anatomical marvels of evolution that they truly are. Whereas the main body of these plants often look quite similar among different species, it's the pitchers that really allow us to separate them out as distinct species. Pitcher morphology not only gives us a convenient means to identify these plants, research is now showing that the structure of these pitchers is likely to be the driving force in their evolution. Let's back up for a second. Before we get to the subject of adaptive radiation, we should take a closer look at the anatomy of these plants. To put it simply, the pitchers of Nepenthes are actually leaves, albeit highly modified versions. What we readily recognize as the photosynthetic leaves of a Nepenthes plant are actually modified leaf bases or petioles. Over evolutionary time, these bases have flattened to increase the amount of surface area available for photosynthesis. From the tip of each of these "leaves" is produced a tendril. Gradually this tendril will elongate and the tip starts to swell. This tip will eventually become the pitcher. The pitchers themselves are highly modified leaves. They are some of the most specialized leaves in all of the plant kingdom. As the tip grows larger, it becomes clear that there is a distinctive lid apparatus. Once the pitcher is fully mature, this lid pops open revealing the death trap filled with digestive fluids. As if producing pitchers wasn't cool enough, each species of Nepenthes produces two distinct forms - lower pitchers, which are produced by young plants as well as on mature plants near the ground, and upper pitchers, which are produced up on the climbing stems as they vine through the canopy. The upper and lower pitchers look radically different from one another to the point that one may easily confuse them for different species. The reason for such stark differences has to do with the type of prey captured. Lower pitchers are generally larger and can capture prey that crawls along the forest floor. Upper pitchers tend to be more slender and most often capture flying insects as well as other creepy crawlies hanging out in the forest canopy. The key to the success of these traps seems pretty straight forward - insects attracted by bright colors and sweet nectar land on the traps and fall to their death. Certainly this holds true throughout the genus, however, there are at least two major variations on this theme and a handful of bizarre mishmashes. As the lid of a Nepenthes pitcher starts to open, a ring of tissue called the peristome unfurls. The shape and color varies wildly between species and this has to do with the methods in which they capture their prey. These variations are the key to the amazing diversity of Nepenthes we see throughout the range of this genus. The first of the three strategies is referred to as the 'insect aquaplaning' strategy. Insects walking around on the peristome of the pitcher find it hard to get a foothold. These are species such as N. raja, N. ampullaria, and N. bicalcarata (just to name a few). The slipperiness of the peristome of these species is further enhanced when humidity is high. Considering how much it rains in these habitats, it is no wonder why capture efficiency is often as high as 80%. Although there is some variation on this theme, pitchers that utilize the insect aquaplaning strategy often lack waxy cells on the interior of the pitcher walls. Slippery pitcher walls are the second strategy that Nepenthes have converged upon. These are species such as N. diatas, N. mirabilis, and N. alata (again, just to name a few) Insects attracted to the pitchers are often lured in by sweet nectar. Once they cross the lip of the pitcher, prey find it hard to hang on and inevitably fall inside. Once this happens, waxy cells lining the interior walls make it impossible for anything to climb back out. It should be mentioned that a slippery peristome and waxy pitcher walls are not mutually exclusive. That being said, there are clear trends among species that show a reduction in waxy cells as peristome size and slope increases. This brings us to the oddballs. There are species like N. lowii, whose pitchers function as a toilet bowl for shrews, and N. aristolochioides, whose pitchers seemed to have abandonded both strategies and now function as light traps similar to what we see in Darlingtonia. Regardless of their strategy, the diversity in trapping mechanisms appear to be the driving force behind the bewildering diversity of Nepenthes. All of the evidence taken together shows that prey capture is at the core of this radiation. There seems to be incredibly strong selective pressures that result in strong divergence in pitcher morphology. The disruptive selection that seems to be driving a wedge between the insect aquaplaning strategy and the waxy wall strategy may have its roots in reducing competition. Nutrients are low and competition for food is high. Different Nepenthes species could be evolving to capture different kinds of prey. Even closely related species such as N. ampullaria, N. rafflesiana, N. mirabilis, N. albomarginata, and N. gracilis all seem to occupy their own unique spot on the spectrum of prey capture strategy. It could also be that Nepenthes are responding to the specific characteristics of the habitats in which they are found. Those inhabiting drier sites may favor the waxy wall strategy whereas those living in wetter habitats tend to favor the slippery peristome. More work needs to be done to investigate where and how these different strategies are maximized. Until then, I think it is safe to say that the diversity of this incredible genus has a lot to do with obtaining food. A carnivorous lifestyle has evolved independently in numerous plant lineages. Despite the similarities between genera like Nepenthes, Sarracenia, and Cepholotus they are not closely related. Researchers have wondered how the highly modified leaves of various carnivorous plant species evolved into the insect trapping and digesting organs that we see today. Thanks to a recent article published in Nature, it has been revealed that the mechanisms responsible for carnivory in plants are a case of convergent evolution. This research all started with the Australian pitcher plant Cepholotus follicularis. More closely related to wood sorrels (Oxalis spp.) than either of the other two pitcher plant families, this species offers a unique window into the genetic controls on pitcher development. Cepholotus produces two different kinds of leaves - normal, photosynthetic leaves and the deadly pitcher leaves that have made it famous the world over. By observing which genes are activated during the development of these different types of leaves, the research team was able to identify which alleles have been modified. In doing so, they were able to identify genes involved in producing the nectar that attracts their insect prey as well as the genes involved in producing the slippery waxy coating that keeps trapped insects from escaping. But they also found something even more interesting. Next, the team took a closer look at the digestive fluids produced by Cepholotus as well as many other unrelated carnivorous plant species from around the world. In doing so, the team made a startling discovery. They found that the genes involved in synthesizing the deadly digestive cocktails among these disparate lineages have a similar evolutionary origin. Although they are unrelated, the ability to digest insects seems to have its origins in defending plants against fungi. You have probably heard someone say that fungi are more similar to animals than they are plants. Well, the polymer that makes up the cell walls of fungi is the same polymer that makes up the exoskeleton of insects - chitin. By comparing the carnivorous plant genes to those of the model plant Arabidopsis, the team found that similar genes became active when plants were exposed to fungal pathogens. It appears that carnivorous plants around the world have all converged on a system in which genes used to defend themselves against fungal infection have been co-opted to digest insect bodies. Taken together, these results show that the path to carnivory in plants is surprisingly narrow. Evolution doesn't always require the appearance of new alleles but rather a retooling of genes that are already in place. On the coastal plains of southeastern North America, there exists a wide variety of pitcher plant species in the genus Sarracenia. These plants are the objects of desire for photographers, botanists, ecologists, gardeners, and unfortunately poachers. Far from simply being beautiful, these carnivores are marvels of evolution, each with their own unique ecology. Pitcher plants are most famous for capturing and digesting insect prey but their interactions with arthropods aren't always in their favor. Browse the internet long enough and you will inevitably find photographs like this one above in which a green lynx spider (Peucetia viridans) can be seen haunting the traps of a pitcher plant. Instead of becoming prey, this is a spider that uses the pitchers to hunt. I should start by saying this is not an obligate relationship. Lynx spiders can be found hunting on a variety of plant species. Instead, they are more accurately opportunistic robbers, stealing potential meals from the pitcher plants they hunt upon. However, what this relationship lacks in specificity, it makes up for in being really interesting. Sarracenia are not passive hunters. They do not sit and wait for insects to blindly stumble into their traps. Instead, they utilize bright colors and tasty nectar to lure insects to their demise. This is exactly what the lynx spider is using to its benefit. The green lynx spider does not spin a web like an orb weaver. It is an ambush predator. They have keen eyesight and will quickly pounce on any insect unfortunate enough to get too close. The reason the spider itself does not become yet another meal for the pitcher plant is because they utilize their silk as an anchor. By attaching one end to the outside of the pitcher, the can safely hunt on the trap without the risk of become prey themselves. In fact, spiders hunting on traps even go as far as to retreat down into the trap if threatened.